As we set off on this leg of our journey, we are once again left with the decision on coming up with a name for this section. Since the main focus of this trip will once again take us to the area of southern Mexico and Guatemala, we can think of nothing better given the timing of this event. With the Mayan "long count calendar" having its end on December 21st of 2012 there are those who have suggested that this signals the end of the world. We make absolutely no endorsement of this or any other "doomsday" theories, but in the unlikely event that the doomsayers are right, I can think of no better place to be. If, in fact, the some end times scenario unfolds there is as much probability that it will begin at what was and is the epicenter of the Mayan cosmography as anywhere else. The fact is the last time we visited here was on about the same time of year in 2009 on our way to South America. We actually climbed a live volcano on Christmas eve that year and were within a few feet of live lava flow (top photo 2nd from left in the masthead above). From Lake Atitlan, and again from Antigua we were within sight of volcanos that were actively venting. If in fact any danger to our future comes from this "hotzone", so to speak, I think we would rather be here where it would be over fast than to wait for the waves of destruction that would take time to ripple around the globe. Again, we neither endorse nor reject any such theories. Not having been on rides of any great lengths over the last couple of years we limited each days riding to 3 to 4 hundred kilometers. After knocking back our last large "American" breakfast at he Bisbee Breakfast Club, we did our crossing at Agua Prieta. The paperwork for the bikes was easier than it was three years ago, but the security bond that you must post at the banjercito has gone way up. It is now in the neighborhood of 450 dollars per, which you must post with a credit card. Upon surrendering the permit when you exit the country $400 of that is refunded to your card. Mexico's north central highlands are relatively flat but there is one really nice section of "twisties" just out of Casas Grandes that we encountered on our second day(above). 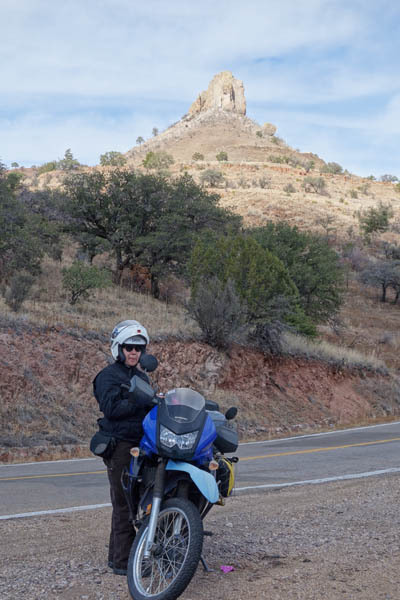 We opted not to do the Barancas del Cobre because it was already cold at Creel's elevation. We would be back through here on our way home, so we opted to make the first few stops one nighters. From Casas Grandes where we took care of getting sim cards and prepaid minutes for our phones we headed to Cuautemoc. We were pleasantly surprised about the phones. While still high at 25 cents a minute to the US, it's still about 20% of what it cost three years ago. I guess Skype has opened Carlos Slim's eyes. The last of our one nighters was Hidalgo del Parral. The town was a major silver producer for more than 350 years. There is a statue of San Jose that overlooks the town in honor of its original name San Jose del Parral. The "Hidalgo" was added in honor of Mexico's revolutionary leader Miguel de Hidalgo. Parral's fame--or more appropriately infamy--comes from the suffering of the indigenous people who were enslaved to work in the mines, and secondly as the place where Pancho Villa was assassinated in 1923. 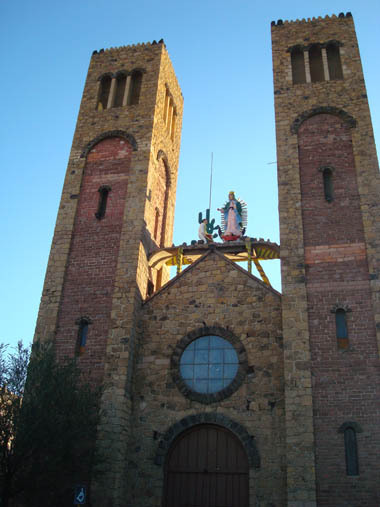 Our Lady of Guadalupe Cathedral is above.